Summer is the time to eat fruit as it ripens on the vine and trees. But, because the fruit season is so short, in many homes it is traditional to make jam. I have tried a lot of recipes throughout the years but I always go back to the same two recipes. One is the standard freezer jam and the other is Aunt Thelma�s prize winning Kool-Aid Jam � you may know it by another name. And, yes, it really is made with real Kool-Aid. Kool-Aid does two things to the jam. It both enhances the flavor and adds color to the jam. This jam has never failed me and because it is so colorful it also appeals to the eye. Although I love freezer jam, space and shelf-life can be a concern and, like I said, this recipe is easy, delicious and did I say prize winning! Jams and jellies have a wide range of prices in the store. Frankly, I am amazed at the price differences. For the most part, they are all made of fruit, sugar or sugar substitute and pectin. Name brands are always more expensive. I look at the jar and if the jam is more eye-appealing than the other brands, I ASSUME IT IS GOING TO TASTE BETTER. Aunt Thelma�s Kool-Aid Jam is not only delicious but also beautiful and you just might assume you are eating freezer jam. But, don�t let the name fool you, this jam has fruit in it. Mash the fruit and combine the fruit, water, Kool-Aid and MCP pectin in a large kettle. Never fill the kettle more than half full. Bring to a boil. Add sugar, and bring to a full boil. Stirring often, boil 3 � 5 minutes. Makes 3 � pints of jam. You can quadruple this if you have a large enough pan. 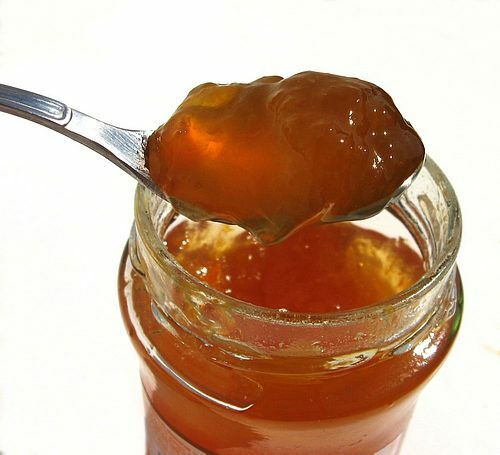 I use only MCP pectin with this recipe and cannot guarantee perfect result with any other brand. In a medium bowl, beat softened cream cheese and butter using an electric mixer on medium speed. Add sugar and mix until well fluffy and light. Add vanilla. Mix the baking soda into the flour. Incorporate the flour mixture � cup at a time. Add vanilla and finely chopped pecans. Rolls dough into 1 inch balls (about 1 1/2 teaspoons). Place two inches apart on ungreased cookie sheet. Using your thumb make an indentation in the dough center. Bake for 8 minutes. 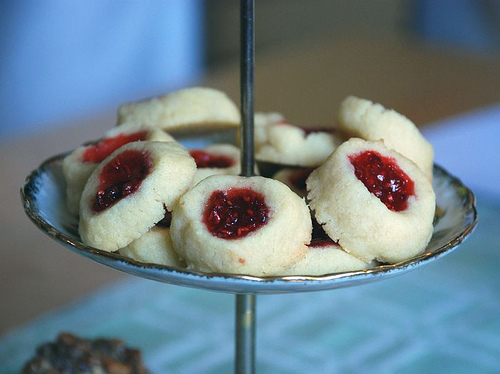 Fill each cookie with jam preserves and continue to cook for another 8 minutes until golden brown.